Work comfortably at a height that's right for you with the sturdy and adjustable Klopfenstein Art Table. 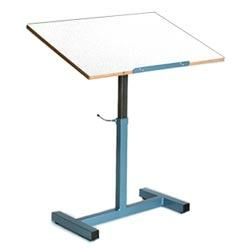 KLOPFENSTEIN Tilt-Top Art Table (Options: 30x36" Top or 30x42" Top; Fixed, Pivots or Pivots & Rotates) Get a workspace to rely on with the Klopfenstein Art Table, which comes in your choice of two different tabletop sizes. Pick from a 30 x 36-inch top or a special-order 30 x 42-inch top to get the ideal amount of surface area for drawing, drafting or painting projects. The top is made of durable melamine that holds up to frequent use, and the spring-assisted top telescopes from 32 to 45 inches to make adjusting it to the perfect height simple. The top can also pivot up to 180 degrees to give you added versatility, and it has a metal edge-stop to prevent materials from sliding onto the floor. A center upright and sturdy base made of 2-inch square tubes provide support for your artistic endeavors, and included leg levelers ensure a steady surface on uneven floors. This oversized unit ships by freight truck for $227.95, and the larger size may require extra delivery time.